A recent report from ExactTarget compares three subscription channels with each other. It helps you to understand the differences that exist between email, Facebook, and Twitter. This will help you to deliver the right message in the right place and effectively integrate these channels to improve acquisition and retention marketing. 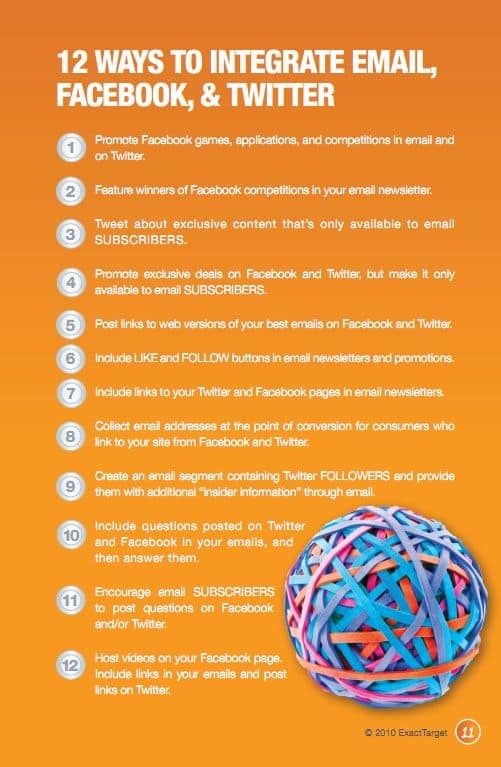 There’s a lot of great data in the report and also some practical ideas, such as: 12 ways to integrate email, Facebook, and Twitter. You can download PDF report or browse the whole series of reports. 20 Tips to Grow Your Mailing List. Social media is getting more important, but mailing lists are still extremely important in regular communication, lead generation and sales. Unsubscribe, Unfollow, Unlike. Don’t Worry! Rejection! It’s terrible they don’t like me! At first glance it seems like a bad thing but in reality the people who leave don’t really have and interest in your brand.